Motorola's most popular radio of all time, now with a digital model. The CP200d is durable, reliable, and rugged. 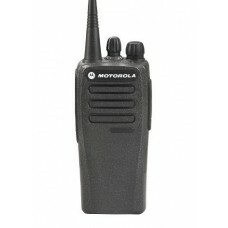 The Motorola CP200d is a great Two-way radio for organizations that need easy to use and dependable radio. Perfect for Construction, Manufacturing, Volunteer Fire Departments, Property Management, Security, hospitality, and Warehousing. Combining the best of two-way radio functionality with the latest analog and digital technology, the CP200d is perfect forbusinesses who need to stay connected. The rugged MOTOTRBO CP200d radio offers all the benefits of the latest digital technology – up to 40% longer battery life, twice the capacity, greater coverage, and superior audio. The CP200d is made to last. It is rated IP54 (splashproof, virtually dustproof), so it can be used even in harsh environments. Moreover, it has been proven tough in Motorola’s grueling Accelerated Life Test program, in which the design must survive a simulated 5 years of hard service before it is accepted. The Motorola CP200d digital version can operate in analog and digital modes concurrently - and to ease the transition to digital, the dynamic mixed mode repeater streamlines automatic switching between analog and digital calls. So you can start using MOTOTRBO radios and repeaters on your existing analog system, then migrate to digital when your business is ready.